The Memorial Candle Program has been designed to help offset the costs associated with the hosting this Tribute Website in perpetuity. Through the lighting of a memorial candle, your thoughtful gesture will be recorded in the Book of Memories and the proceeds will go directly towards helping ensure that the family and friends of William Morgan can continue to memorialize, re-visit, interact with each other and enhance this tribute for future generations. 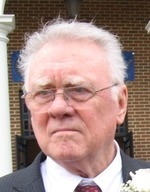 WILLIAM ANTHONY MORGAN, 87, of Jackson, NJ, passed away on Saturday, May 26, 2018, after a brief illness He is survived by his wife of nearly 65 years, Gail Morgan (Bickel); his children, William Morgan, Jr., Douglas Morgan, Susan Simms (David), Michelle Morgan , and Tracy Coulson (Leonard). He was predeceased by his son, Robert Morgan; and by his son in law, Kevin Evans. He was the proud father of six children, ten grandchildren, and five great grandchildren. William served in the Army during the Korean War, after which he began a lifelong career in the automobile industry. He was an innovator with Kaiser Jeep, served in senior management positions with Jeep and Mazda motors of America, and led the American distribution network for DeLorean Motor Company and its iconic DMC-12. Bill will be remembered for his love of family, quick wit and his turn of phrase. Rest in peace. Services will be private and under the direction of the GEORGE S. HASSLER FUNERAL HOME, Jackson Twp., NJ. If so desired, contributions may be made in William’s memory to the American Heart Association, 1 Union St., Suite 301, Robbinsville, NJ 08691 www.americanheart.org. For further information and to send condolence messages to the family, please select a tab on the left.